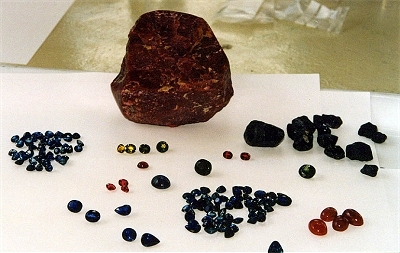 Rubies and sapphires from Cambodia. 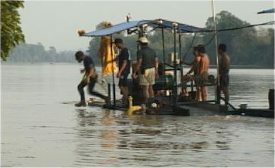 Over the many years, my various partners and I have experimented a lot with secondary recovery systems to catch fine gold and gemstones that get sucked up the suction nozzle of a floating dredge. There are numerous issues involved, each which must be carefully resolved to make it all work out right. I strongly advise you to study these issues for yourself as much as possible before deciding how to acquire accurate samples, and what to do for a production dredge if you decide to move forward with a mining program. If these problems are not carefully considered and resolved in the construction of the equipment, the problems will definitely have to be dealt with in the field, where it becomes much more difficult to fix them! Since the purpose of sampling is to accurately determine the real value of gold (and/or gemstones) in the river gravels, it is important how you acquire the samples. And if the samples turn out well, it is vital that you design your production dredge and recovery system from the beginning, to make certain they will actually do the job. The reason I stress this point so strenuously is because my team has been called in so many times to help with projects that did not acquire equipment that would efficiently recover fine gold and/or gemstones in the first place. I also advise you to please not take for granted that gemstone-dredges advertised by various dredge-builders within the industry will recover diamonds or other gemstones efficiently just because the builders advertise that they do. I encourage you to review the points that I will outline here. Then you will have a foundation of understanding from which to ask questions and make your own judgments at the time when you will need to make pivotal decisions. Gemstones are not heavy like gold. Therefore, they are much more difficult to recover. 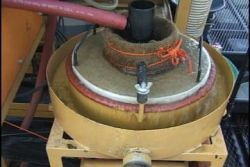 Conditions must be set up to near-perfection to effectively recover gemstones from the volume of sand and gravel which passes through a dredge nozzle. This is especially true of production dredges in the hands of experienced operators! Any enquiry into gemstone-recovery on suction dredges should certainly lead you to the subject of “mineral jigs”. A mineral-jig is a mechanical device that can be adjusted to create a specific suspended medium inside. As raw material flows into a jig which has been set up properly, different minerals are separated according to their specific gravity. Minerals that are lighter than a specific weight-range are allowed to flow off the top of the jig as tailings. Minerals that are heavier are allowed to settle to the bed, or to the bottom of the jig. The heaviest finer-sized materials (mostly gold and iron) are allowed to (flow) bleed out the bottom of the jig to keep it from concentrating with heavy material. Heavier materials are then collected elsewhere, or are directed to even more finely-tuned recovery systems. 1) classify and separate the smaller-sized raw material that is sucked up through the dredge’s suction nozzle? 2) What size-classification and how much volume of material will feed the jig? 3) How much volume and velocity of water will be included with the feed to the jig? 4) What will you do with the heavier material that is bled from the bottom of the jig? 1) Classification: You cannot direct large-sized materials (rocks) into a mineral jig and expect it to perform well. This is actually true of any recovery system being set up to recover gemstones or fine-sized gold. Some method of screening is necessary to “classify” the size-range of materials that you want to direct into each type of recovery system. The more that different size-fractions of material are separated from each other, the easier it is to separate gold or gemstones from the other materials by their differences in weight. Since dredges have limited space to work with (usually on a floatation platform or two), classification systems must be kept reasonably simple and portable. Most suction dredges are set up with a fixed (not mechanical) classification screen which material and water flow across inside the sluice box. Riffles and various types of traps are constructed below the screen to trap gold and other valuable minerals out of the flow of water. All of the material that passes over top of the classification screen, or that is not trapped by the riffles under the screen, is allowed to flow out of the box and be discarded as tailings. For lack of a better term, let’s call this a “hydraulic classification and recovery system,” because it depends entirely upon water-flow to move raw material across the classification screen and through the riffles. 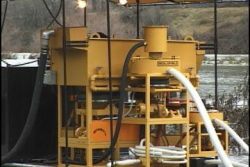 This is the type of system that you can expect to receive as standard dredging equipment on today’s market. Hydraulic classification and recovery systems have evolved over the years to the point where they generally recover gold and platinum with a reasonable degree of efficiency down to size-fractions relatively small in size. How fine in size depends upon various factors, like the purity of the gold, its average shape (round, flat or crystalline), and the nature of the material (slurry) that is flowing through the recovery system along with the gold or platinum. It is reasonably safe to say that any recovery system is efficient down to a certain size-fraction of gold or platinum in any given area. The size-fraction might vary from one place to another. The reason for this is that the specific gravity of gold and platinum is generally 5 to 6 times greater than the average of other materials which commonly exist within a streambed. This incredible difference in weight will generally allow pieces of the heavier metal to penetrate the screen and drop behind the riffles in a sluice box – even though there is a strong force of water present to wash larger-sized material (rocks) over top of the screen. It is also reasonably safe to say that the smaller a piece of heavy metal is (gold or platinum), the more it will be influenced by the fast, turbulent flow of water that is required to wash larger-sized material through a sluice box. For example, it requires a violent force of water to wash 9-inch rocks over top of a screen in the recovery system of a 10-inch dredge. So the smaller it is, the less likely that a piece of gold will drop through a hydraulic screen and get trapped behind a fixed riffle. Therefore, hydraulic classification and recovery systems lose efficiency as the particle-size of a heavy metal becomes smaller. It is important to understand this: Because gemstones are only slightly heavier than quartz, and are within a similar weight-range as the average materials generally found in a streambed, hydraulic classification systems on dredges are not an efficient method of sizing raw material. This means that probably more gemstones wash across the top of a stationary classification screen (into tailings), than drop through it into the recovery system. Furthermore, hydraulic recovery systems (fixed riffles and baffles) are actually designed to discard gemstones. Because gemstones are light, it is unreasonable to expect them to drop through a classification screen that has a torrent of water passing over top. And then, because riffles will quickly accumulate a concentrate of material behind them that is heavier than the average specific gravity of a gemstone, you should not expect to recover gemstones efficiently using fixed riffles. (A) A fixed screen which a flow of raw material is washed across by the force of water, with some portion of minus-sized raw streambed material dropping through. This system works relatively well on heavy metals down to a certain size-fraction. Efficiency is lost below that size, and there is poor efficiency on gemstones (they are too light). Since it is impractical to refit smaller-sized dredges (which must remain portable for sampling) with mechanical classification, here is a substantial explanation of the system which we have developed to effectively recover more fine gold on our conventional suction dredges. It combines two classification screens to more-effectively separate material-feed into three size-fractions, each which is directed into a different recovery system. 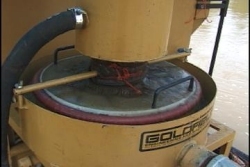 The smallest gold particles (which are most difficult to recover) are directed into low-profile riffles along the bottom of the sluice box which have long been proven to be very effective at trapping fine gold. 2) Size and volume: Jigs are available in different types and sizes. Generally, a certain size of jig is designed to process a given volume of material. Each manufacturer will have their own set of guidelines. I say “guidelines” because there are variables that will change from one location to the next. The main consideration is the difference in weight between the mineral you are trying to save, and the medium that it is mixed with. For example, because the weight-difference is so great, it is relatively easy to drop a particle of gold (19.6 times heavier than water) through a suspended medium of pre-sized quartz crystals (only 3 times heavier than water), because the difference in weight is more than 6 times. Therefore, with heavy metals, there is greater margin to introduce a larger variation of size-fraction (different sized material) into the jig, or a larger volume of pre-sized raw material, without forfeiting recovery. If you are trying to drop gold particles through a raw material made up of iron (8 times heavier than water), you will be required to tighten-up the sizing and slow down the feed to the jig. This is because the weight-difference between what you want to retain and what you want to discard is only around 2 ½ times. 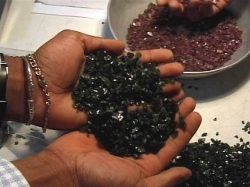 Sizing and volume are critical in the recovery of gemstones (usually only around 3.5 times heavier than water), because there will be only the smallest weight-difference between the valued material and the other streambed materials which must be rejected by the recovery system. Summary: Sizing and volume requirements for jigs are largely affected by the difference in weight between the type of material you are trying to recover, and the raw material you want to discard as tailings. This becomes critical as you try and recover gemstones with efficiency. 3) Water feed: Most suction dredges operate on a “venturi” system, where a stream of high-pressure water is pumped into a power-jet at an angle to create a vacuum through the suction hose and nozzle. 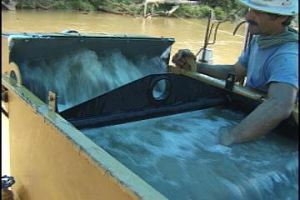 In this way, gravel and rocks can be sucked up from the bottom of the river and directed to a screening or recovery system floating at the surface, without having to pass them through a water pump. This allows a suction dredge to be manufactured at a small fraction of the cost to produce a dredge of the same size which must pass rocks and material through a pump. But venturi-dredges are limited, in that they cannot lift streambed material and water more than about a foot (or less) above the water’s surface. Therefore, anything that is going to initially be done to raw material excavated by a suction dredge must be accomplished directly at the water’s surface. This is the reason why almost all standard suction dredges are equipped with hydraulic classification and recovery systems; because there is very little room at the water’s surface to do much else. 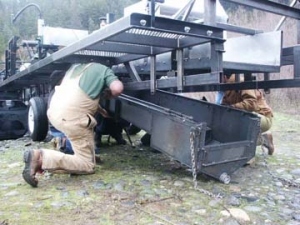 Men installing the Catch-hopper which mounts under the shaker-screen on a 10-inch commercial Pro-Mack dredge. 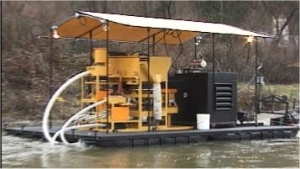 Classification systems used on a suction dredge almost always drop the minus-sized gravels into a sump or hopper that is located below the water’s surface. Therefore, to get the classified material up into a recovery system, it will need to be pumped. Any jig is designed to allow only so much water-flow with the feed. The reason is that too much water velocity can wash sized-material across the top of the jig before the suspended medium has an opportunity to place particles where they should go. Water-flow through a jig is highly critical in the recovery of gemstones because they are so light. 4) Bleeding off the heavy material: One of the reasons why jigs work so well, is that they are allowed to keep bleeding off the heaviest materials from the bottom. These otherwise would accumulate inside the jig and alter the suspended medium which creates the desired separation of your target-mineral from the other streambed materials. For example, if your target mineral is an average weight of 3.5 (times the weight of water), you must bleed enough heavy material from the bottom of the jig to maintain a suspended medium that is lighter than 3.5. Get the idea? If the suspended medium in the recovery system is heavier than your target mineral, the system will then be set up to discharge your target mineral along with tailings. What you should do with the heavy materials from the bottom of a jig depends entirely upon what they contain. The secondary-jig can be more finely-tuned to further separate a finer-classified, slightly-heavier material at a slower speed. Then the finer-classified, heavier material from the bottom of the secondary jig is fed into a “finishing-jig” – which can be tuned to complete a final separation. Most or all of the gemstones will become trapped on top of the jig-beds (classification screens) inside of the jigs. If there are fine-sized heavy metals present, the bleed from the bottom of the finishing-jig usually is directed into a final concentrating device – commonly a centrifugal bowl. The final concentrate is then separated in camp, often with the use of a mechanical shaker table. This final step is demonstrated by a video segment included in an article that I wrote about a sampling project we performed in Cambodia. 1) Dredge platforms jerk around a lot as the suction nozzle is managed underwater. The suction hose is flexible, so there is an accordion-affect when varying amounts of suction are used at the nozzle. This causes the dredge to bounce around. The bouncing can throw off critical settings on mechanical recovery equipment. 2) Demands made upon the dredge’s main water pump fluctuate widely, depending upon how much suction is being used at the nozzle. If the dredge’s water pump is being used to supply water to mechanical recovery systems, the pressure-fluctuations can throw off the criticle suspended mediums that make the systems work. 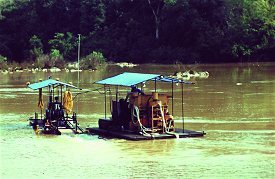 3) A production gold dredging platform has a constant parade of divers, managers and tenders moving about while doing their various jobs. Most recovery systems are designed to be fastened down to a level, stable platform. The movement of numerous people around a dredge platform can throw off important settings. 4) Security: The final product(s) on a commercial mining operation should accumulate in a safe location where traffic can be carefully controlled. 5) These mechanical recovery systems have a lot of moving parts. It is better to keep wet, slippery divers and all their gear clear of the machinery. A) A dredge platform that you can move around, put divers and tenders on, pump raw material to; and pump classified materials from. B) A recovery platform that receives the classified materials and processes them. This system needs to be carefully engineered, and large enough to manage the volume of raw, classified material that is directed to it from the dredge. You only need to have one or two operators on this platform, so as to not upset the delicate balances that can be easily offset by people walking around changing the way the platform is sitting in the water. I have found that when you try and put it all on one platform, you are forced to ignore several vital factors which can ultimately add up to a dredge-package that does not do the job very well.